The old saying has been inverted: today, all politics is global. The first decade of this century has been dominated by new kinds of foreign policy concerns that transcend the familiar borders of the world’s nations. From the moment Flight 11 crashed into the World Trade Center, the placidity of the 1990s vanished and a new war against radical Islamist terrorism began. An Inconvenient Truth may have been the most compelling and popular call to action around our warming climate, but the clamoring for action on global climate change is being heard throughout the world–and the crisis’s effects are similarly vast. The sars and avian flu outbreaks have heightened our awareness of global health vulnerabilities. An economy that is as vulnerable to legislation emanating from Washington as it is to pronouncements from the central banks of Asia has made it abundantly clear that the future of our economy begins where our borders end. The boundaries between domestic and foreign policy are not just blurred; they are intertwined. The old saying has been inverted: today, all politics is global. In this new era, we believe that the response to these challenges must be as novel as the challenges themselves. In a world where text, photos, and video move in an instant, heads of state are voices in a global conversation, speaking to millions of citizens in other countries as easily as they address their own parliaments. In a world where most people now live in democracies and in which millions of others can communicate via cell phone and laptop, foreign policy must realize that ordinary people’s opinions matter and must be considered. Security threats such as terrorism, global warming, and epidemic disease will be surmounted only by the personal action of countless individuals; no longer is an able diplomatic corps or friendly relations among heads of state enough. It is with this belief that we present a collection of articles that explore some of these global challenges through the eyes of the world’s rank-and-file. Fawaz Gerges, a Middle East scholar at Sarah Lawrence College, examines what the world’s Muslims actually think, compares that with what Al Qaeda says they think, and shows how our own conflation of the two affects our foreign policy. Peering into the chat rooms and neighborhoods inhabited by radical Islamists, Andrew Exum brings his unique perspective as a former Army Ranger captain who fought in both Iraq and Afghanistan to the question of what happens when the thousands of jihadists who saw combat in Iraq come marching home to Lebanon, Morocco, London, and Paris. Moving east, Hu Ping–a courageous leader of the Chinese democracy movement, now living in exile in the United States–helps us understand what people are thinking in China as the world’s eyes turn to that rising power for the Beijing Olympics. In a similar vein, Clay Risen looks at the spectacular new buildings erected in the People’s Republic in anticipation of these games and asks: Should superstar architects be building in such a repressive state? Writing from the health care projects he runs in Rwanda, Columbia public health professor Josh Ruxin argues that a revolution is needed in global public health, one that puts sound management on par with selfless acts. And Adam Sheingate, an expert on food politics at Johns Hopkins University, peels the wrapper off the global food chain to explain why subsidy policies emanating from Capitol Hill contribute to food riots in Haiti, obesity in America, and starvation in sub-Saharan Africa. Also in this issue, Ted Nordhaus and Michael Shellenberger, two of the most creative thinkers in the environmental movement, tell us that the Kyoto Protocol is as dead as the mindset that birthed it. To stop global warming, they argue, we need to shift the focus of policymaking away from pollution control to technological innovation. Isabel Sawhill and Emily Monea of the Brookings Institution tear up the intergenerational contract and say that we need to do more for the young, not the old. Penn Law Professor Kermit Roosevelt III examines how judges think–and how they should. Former Marine Colonel T. X. Hammes sketches the military of the future. Stanford’s Henry Greely offers a word of caution to Jamie Metzl’s vision of a genetic arms race [“Brave New World War,” Issue #8], and John Edwards’s former foreign policy adviser, Derek Chollet, assesses where America stands in the world today. 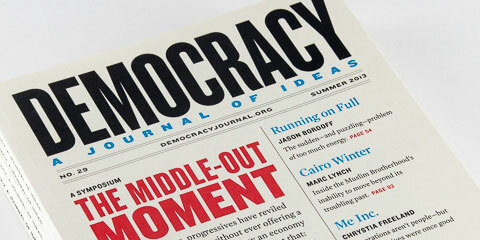 At Democracy, we deal with ideas, but we know firsthand that the world is shaped by people. This April, we lost a dear member of our family. The sudden passing of Adam Solomon, a founding member of our Board of Advisors, was so stunning precisely because he was an individual who was always so full of life. Adam was not only a person of achievement and brilliance, he was–above all else–a man of decency, caring, and warmth. He will be sorely missed.